As per Econonomic Times, OYO displays 70,000 rooms in 200 cities in India. It is backed by Japanese telecoms & internet giant SoftBank. Oyo rooms has raised $62 million from the Japanese company and showing high prospects for the future. The start up was founded in 2011 by 18-year-old Ritesh Agarwal and in just 6 years it has reached heights that no can dream of. There is an article in Yourstory on The curious case of Oyo Rooms: looking at a funded startup from an end user perspective which is a review of Oyo Rooms from an end user perspective. Ritesh Agarwal commended on the post. 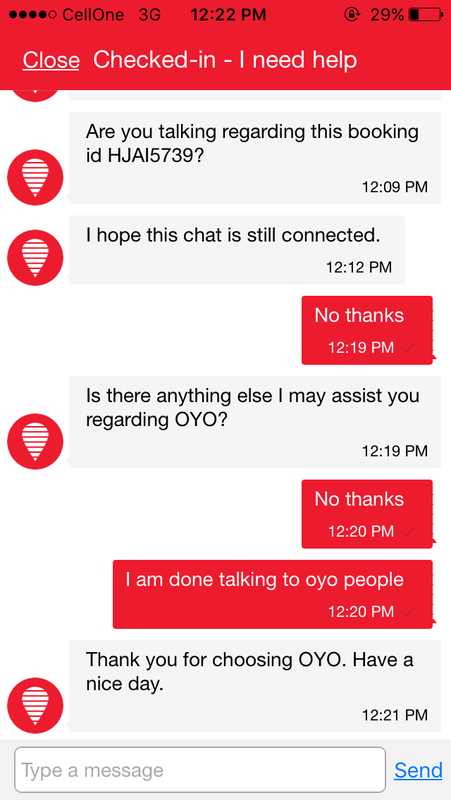 The author, a start up journalist writes that he had a broken experience with Oyo. Livemint also published a post of the CEO Ritesh Agarwal on how Oyo rooms have grown in the last few years. OYO Rooms is not a hotel/guest house owner and has no control over the conduct or behaviour of the Channel Partner or the quality, fitness or the suitability of the services provided by Channel Partner. OYO Rooms disclaims any and all liabilities in this regard. OYO Room is not the owner of the Accommodations and will not be liable for any services or lack of them at the Accommodations booked by the User. OYO Rooms cannot and shall not be liable for any loss or damage arising from Your failure to comply with this clause. Basically OYO rooms do not have any rooms at all. OYO rooms is a website/mobile applications that list hotels and amenities offered by the hotel. OYO rooms insist that a hotel should have minimum facilities to be listed under OYO. If you book under Oyo and the hotel rejects the booking, you are basically on the street as OYO people cannot do anything. If hotel people behave to you badly or if the services are bad, there is no point in complaining as OYO do not have any control over them. What they will do mostly is to ask you to change to a different property. Oyo list the hotel as OYO Property as in the Map which is also misleading as they do have any property by their own. OYO rooms brought a standardisation in the middle class affordable hotels. It provided list of hotels that supposedly has decent clean rooms and linens, air conditioning and WiFi. It created a fear in property managers that their hotel will be unlisted if the minimal requirements are not managed. Hotels in India were overcharging customers without providing the basic amenities and sometimes treating with abuses when customers complain. This has stopped mostly as Oyo started the standardisation and increased competition. Hotel managers could not reject Oyo as they brought more customers through the app. It was a win-win situation for Oyo, Hotels and Customers. Introduction of OYO captain happened due to high number of complaints by the customers. However usually they do not care about the customers. They do not even attend the call and never calls back. Sometimes they come and shout at you to make sure that you will not call again. 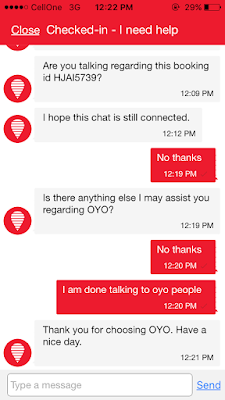 Oyo customer care was one of the best customer care centres however as usual once the volume of booking started increasing, quality also reduced. Now it has lengthy waiting time, Call Disconnect the usual replies such as we are sorry for the trouble, we will see what we can do etc. The Oyo app and Oyo website gives two different rate for a room. Hence customer is forced to use the app. The rooms images listed in the app / website do not have a single similarity with the actual room. Oyo should use actual on-site images than manipulating with certain angles to bring more space, decorating rooms while taking pics etc. and mislead the customer. Customer book for an OYO room but the hotel manager gives a normal room and says this is the Oyo room. This practise was so rampant few months back but reduced significantly as Oyo introduced checked in room number on the app. There are very few rooms that are less than Rs 999. However Oyo still advertise as they are offering all rooms for Rs 999. Oyo has started Unmarried Couple Listing to ease stay for couples. However this has lead to rise of low quality hotels and lack of proper facilities. Oyo is not doing proper monitoring of these hotels in order to show rapid growth and higher number of customers. Oyo was a Start-up now its a company and its time to take responsibility and work towards improving the foundation and not advertising. It is time to take a call on whether Oyo care about reputation or is it just about the projection of higher profits.